[Arnet_et_al_20131000] Arnet, Kayla, Michaela Butner, Victoria Chavez, Chloe Chen, Piper Davis, Natalia Fernandez, Tori Hittner, Chun Tao Kuan, Tamara Lash, Hagan Le, Patch Leischman, Kim McAloney, Karen Leon Moreno, Vanessa Marquez, Ireland Massey, Janet Nishihara, Enjun Ren, Abraham Rodriguez, Marilu Solis, Sansan Sun, Izaak Tobin, Natalie Vega Juarez, Megan Wing, DeLana Wolfe, and Chelsea Young 2013. Untold Stories: Histories of Students of Color at Oregon State University. Oregon State University Libraries and Press, Corvallis, Oregon: 38 pp. [PDF_4_MB]. [Bates_et_al_20140100] Bates, Lisa, Ann Curry-Stevens and Coalition of Communities of Color 2014. The African American Community in Multnomah County: An Unsettling Profile. Portland State University, Portland, Oregon: 118 pp.[PDF_3_MB]. [Dilg_Brooks_20140218] Dilg, Janice and Geoffrey Brooks 2014. Black Student Activism at Oregon State in the 1970s: Geoffrey Brooks Oral History Interview, February 18, 2014. Oregon State University Libraries, Corvallis, Oregon: 13 pp. [PDF_1_MB]. [Gardner_et_al_19920918] Gardner, Deborah, Andrew Clark, Delana Foster, Saretta Horn, Monica Owens, Samona Stroud and Tyran Ward 1992. 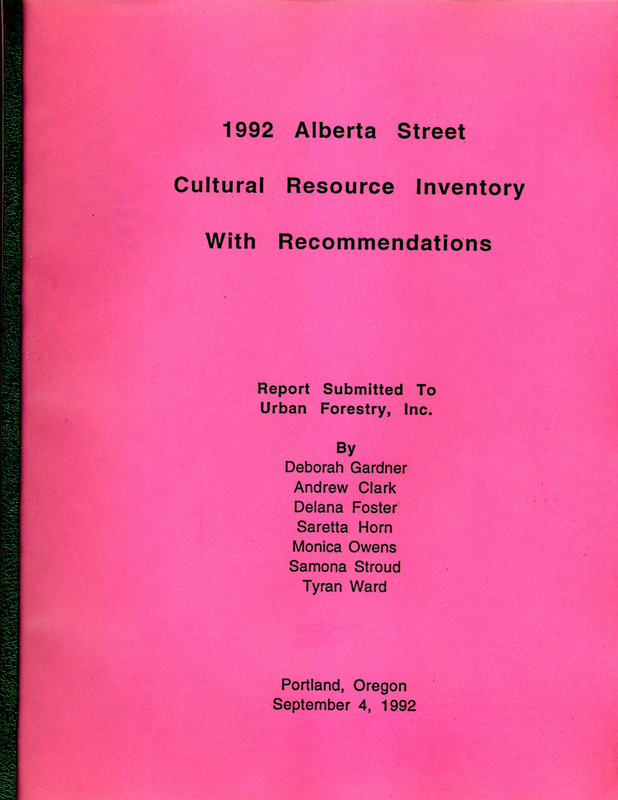 1992 Alberta Street Cultural Resource Inventory with Recommendations. 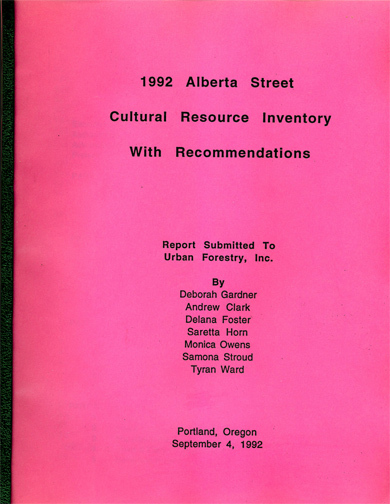 Urban Forestry, Inc., Portland, Oregon: 150 pp.[PDF_11_MB]. [Gibson_20070000] Gibson, Karen 2007. "Bleeding Albina: A History of Community Disinvestment, 1940-2000," Transforming Anthropology. American Anthropological Association, University of California Press, Vol. 15, No. 1: 3-25. [PDF_1_MB]. [Grice_19881200] Grice, Michael 1988. "Youth Entrepreneurship: Empowerment Through Innovation," IN: The Youth Policy Institute 1988. Youth Policy, Vol. 10, No. 12, December: 28-31. [PDF_8_MB]. [Griffin_20150300] Griffin, Luke 2015. "Alberta St. Project Revisited 23 Years Later," Concordia News. Concordia Neighborhood Association, Portland, Oregon, March: 1, 2. [PDF_4_MB]. [Haase_20140000] Haase, Diane 2014. "Beyond Cowboy Science: Simple Methods for Conducting Credible and Valid Research," Treeplanters' Notes. USDA Forest Service, Portland, Oregon, Vol. 57, No. 2: 32-43. [PDF_1_MB]. [Mickle_et_al_20090300] Mickle, Liza, Nicholas Starin, Carmen Piekarski, Kevin Martin, Ralph Sanders, Dan Pauley, and Liza Mylott 2009. East Portland Historical Overview & Historic Preservation Study. City of Portland Bureau of Planning and Sustainability, Portland, Oregon, March: 70 pp. [PDF_8_MB]. [Moore_et_al_20111000] Moore, Christopher, Marc Kerschhagel, Janet Bell, and Elini Janis 2011. Opportunity for Black Men and Boys: Public, Media Depictions, and Media Consumption (Executive Summary). The Opportunity Agenda, New York, New York, October: 10pp. [PDF_1_MB]. [Moreland_et_al_19930200] Moreland, Kimberly, Julia Gisler, Jean Hester, Richard Bellinger, Susan Gregory, and Dora Asana 1993. Portland's Albina Community: The History of Portland's African American Community (1805 to the Present). City of Portland Bureau of Planning, Portland, Oregon, February: 155 pp. [PDF_7_MB]. [NCEBC_20020000] National Council on Educating Black Children (NCEBC) 2002. National Blueprint For Action IV. National Council on Educating Black Children, Indianapolis, Indiana: 80 pp. [PDF_2_MB]. [Ponds_Grice_19920229] Ponds, Phadrea and Michael Grice 1992. "Interview With Micheal [sic]Grice, February 29, 1992," IN: Ponds, Phadrea 1993. Under Represented Minorities in Natural Resource Jobs, Occupations and Related Activities: An Examination of African American Professionals. Master's thesis, Oregon State University, Corvallis, Oregon: 106-125. [PDF_6_MB]. [Rizzari_20050607] Rizzari, Meredith 2005. Re-Imaging a Neighborhood: The Creation of the Alberta Arts District, Portland, Oregon. Master's thesis, Portland Statee University, Portland, Oregon, June 7: 132 pp. [PDF_4_MB]. [Smith_20140625] Smith, Donovan 2014. "Revisiting Alberta," The Portland Observer. Mark Washington, Sr., Publisher, Portland, Oregon, Vol. XLIV, No. 25, June 25: 1, 4. [Starin_20100218] Starin, Nicholas 2010a. History of African-Americans in Portland & Oregon: A Selected Bibliography. Research Guide Series, No. 3, City of Portland Bureau of Planning and Sustainability, Portland, Oregon, February 18: 11 pp. [PDF_1_MB]. [Starin_20100312] Starin, Nicholas 2010b. Architecture, Architectural History & Historic Preservation in Portland & Oregon: A Selected Bibliography. Research Guide Series, No. 2, City of Portland Bureau of Planning and Sustainability, Portland, Oregon, March 12: 17 pp. [PDF_1_MB]. [Wilent_20131200] Wilent, Steve 2013. "Field Tech: Are You Ready for Vest-Mounted MobileLidar?" Society of American Foresters The Forestry Source, December: p. 12. [PDF_2_MB].